Gezabel, aka Kiowa Classmate, formerly Pico, is an 10-year-old brindle female born June 17, 2007. Her sire is Kiowa Sweet Trey, and her dam is Kay Quin Quantas. There are 10 races on record for her on Greyhound-Data.com, starting December 11, 2008, at Flager in Miami, FL, and ending there August 16, 2009. 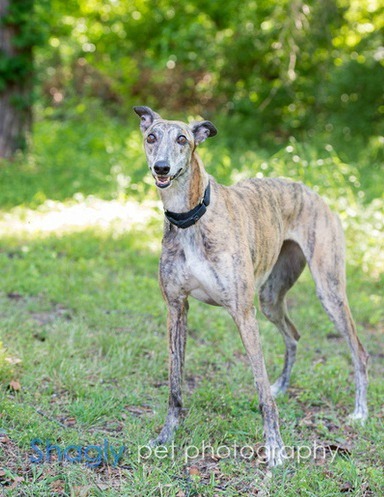 Gezabel is one of 9 greyhounds GALT received from a Fort Worth Animal Control cruelty case. Just like the other rescued dogs, she was positive to several tick borne diseases as well as carrying a huge load of intestinal parasites. She has been treated for all. With all she has been through, this is one happy girl - her tail is always going! Gezabel is a voracious eater, and she is a quick study, too, conquering the doggie door right away. Gezabel is not cat or small dog tolerant at this time. She would do best in a home where someone is home during the day or where she can be let outside midday or have access to a dog door. Gezabel was in a home for almost a year, but has returned to GALT due to aggressive behavior towards the small dog in the house. 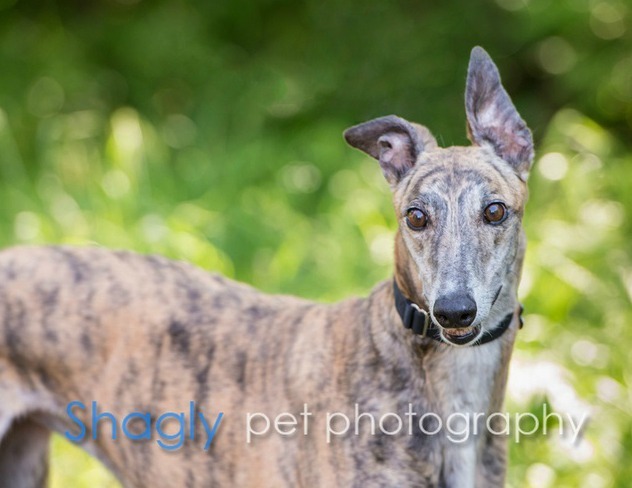 You can read about Gezabel's arrival and survival at GALT here. Gezabel's skin issues were greatly helped via the use of Vetericyn! Gezabel is a special girl who went through a lot in her first 3 years of life and still loves with all her heart. She was one of the FWACC 28 and the sickest one to survive. Gezabel has lingering effects from Meningitis Myelitis that sometimes materializes when she cries out as she lays down. Because of her condition, it is difficult for her to be comfortable in a crate so we do not crate her when we're out. Gezabel doesn't let anything dampen her spirits though! We often say she doesn't have an original thought in her pretty little head - whatever the pack is doing, she wants to be part of it! She happily trots after our other dogs and likes to get in on the fun. She is very affectionate and likes to stay close to her people. She loves to go on walks and settles in quickly when in the car. Gezabel does not counter surf and does not get on furniture. While Gezabel is housetrained, she does have an occasional bowel accident if she does not get outside in time. She will bark or stand by the door to let us know she has to go and if we aren't home when that happens, she will leave a deposit on the mat. As long as we pay attention to her signals and don't leave her for more than 6 hours, she is fine. She did master a doggy door in a previous foster home. Gezabel's ideal forever home will have at least one dog companion, no kitties, someone who can let her out multiple times a day and an understanding of her special needs. As long as there is a comfortable dog bed, or two, other dogs and people to love - her world will be complete!